1. Accurately award points and record the competition score. Scores will be recorded on a blackboard, easel, or overhead which should be visible to all contestants and NOSB officials. The point awards are: 4 for each correctly answered toss-up question, 6 points for a correctly answered bonus, and 0-20 points for a Team Challenge Question. The only variation to the above is when a contestant INTERRUPTS a toss-up question while it is still being read, is recognized, and gives the wrong answer. Four points  are deducted from the contestant’s team. The opposing team then has the opportunity to answer the interrupted question after it is re-read in its entirety; and, if a member of the opposing team answers the toss-up correctly, they receive four  points for the toss-up question and are then asked the bonus question. As you keep track of the score, two columns should be recorded for each team. 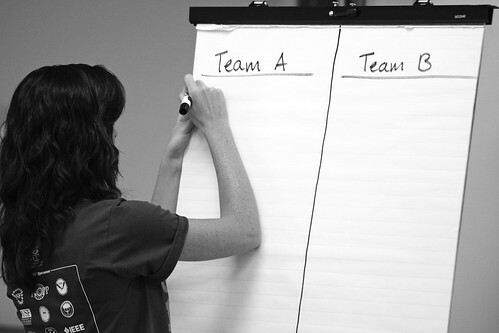 In the first column, record the points a team receives on each individual question with toss-up, interruption, bonus, and team challenge points being recorded separately. The second column should contain a running total of the team’s points. If recorded in this fashion, the point total can be checked at the end of the round. 2. Post-game. Provide the tally sheets (flipchart or overhead) to the moderator so that they can be included with the packets of used questions and official score sheet that will be taken to Ocean Bowl Central by a runner.